Friday afternoon, it turns out, is a great time to shop at the Roosevelt Whole Foods if you’re hungry. I usually go food shopping early on Monday mornings when stores are deserted, and I never see samples then. Today I scored some excellent snacks before and after settling in with a coffee to sketch at the café. Unfortunately, as I’ve observed before, Whole Foods patrons generally do not settle in – they eat and run. Prepared for this, I sketched quickly and tried to compose the scene so that if a person got up and left, I could fill in with whoever sat down afterwards. It was easier, though, to compose small vignettes rather than entire scenes. 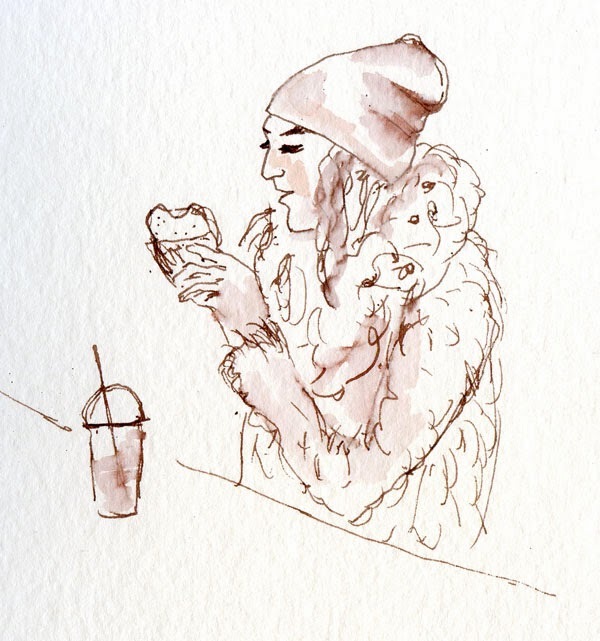 I caught a woman taking a selfie with her grandson, another woman feeding her little boy, and a teenager wearing a faux fur jacket that was both fuzzy and sparkly as she wolfed down a sandwich. Each ate and ran within 15 minutes. All those short poses at Gage’s life drawing sessions are paying off. 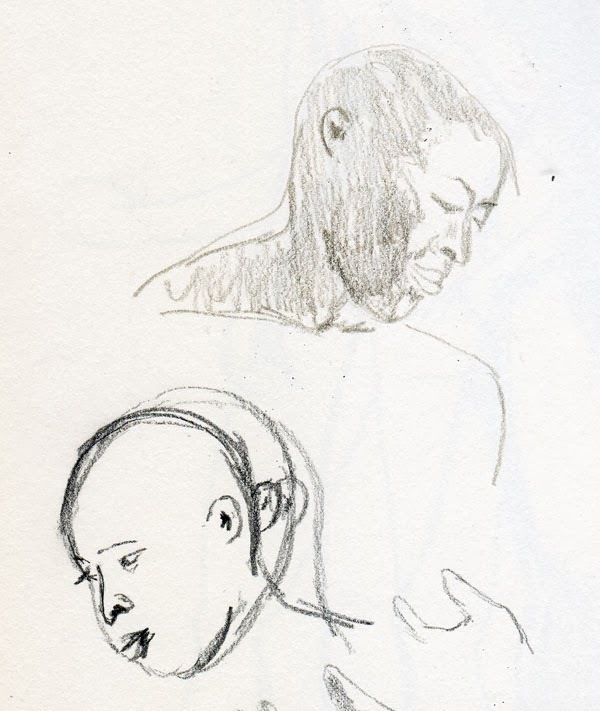 Ever since last October, against all the “rules,” I’ve been using a fountain pen for some of the longer poses at life-drawing sessions. (It’s as rebellious as this good girl gets.) Today my favorite Sailor pen filled with my favorite Diamine Chocolate Brown ink ran dry right after I started a 20-minute pose (at left), so I had to continue it with Pilot Iroshizuku Kiri-Same, which has such a pale wash (as I discovered previously) that I had to help the shading along with a light gray Zig marker and the Diamine Grey ink I keep in a waterbrush. To my surprise, I like the mix of the warm and cool together. Sometimes running out of a favorite turns into a good experiment. Believe me when I say I am not one of those people who get excited about new household appliances, especially a vacuum cleaner. I would not be pleased if my husband gave me one for my birthday. Nonetheless, when our old vacuum gasped its last breath after many years of hard service, I actually was pleased to go to Sears to buy this highly rated Kenmore to replace it. The fact that it’s cherry red like my car was a bonus. 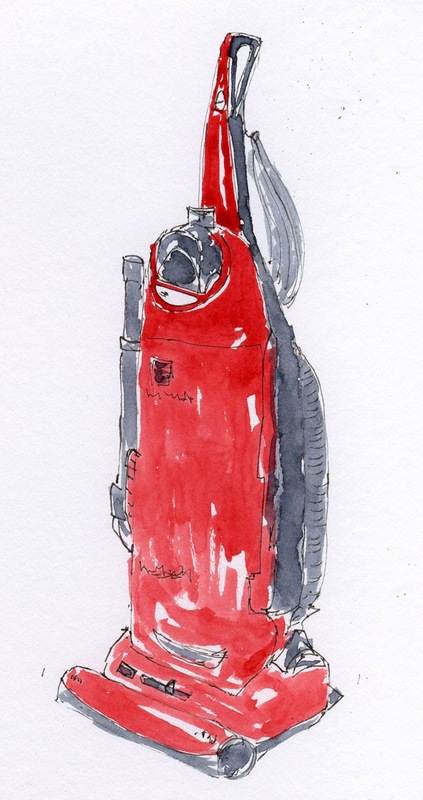 Halfway through this sketch, I realized that my complaint about vacuum cleaners (and probably many other household appliances) is very similar to my complaint about cars: They have no straight lines, yet they are also not organic, and the surfaces are shiny and reflective and therefore difficult to depict with watercolors. 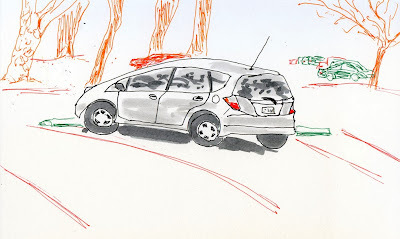 The only advantage sketching this vacuum cleaner has over sketching most cars in my neighborhood is that you are less likely to be familiar with this particular model than you are with Priuses and Subaru Outbacks, so I might get away with less-than-accurate proportions. One of my addictions is ink samples from GouletPens.com. At a very affordable price (well, affordable as long as you don’t collect as many as I do! ), you can try small quantities of a variety of inks without the risk of investing in full bottles. I’ve discovered several inks from samples that I liked enough to purchase full bottles of later. But more often than not, I’m glad I spent only $1.25 to $2.50 on a sample that I either didn’t care for or that I liked for writing but not for sketching. A few weeks ago I alluded to my fetish for the Pilot Iroshizuku line of overpriced Japanese inks. Not only do they have poetic, nature-based color names like Shin-kai (Deep Sea) and Syo-ro (Dew on Pine Tree), they come in elegant, stylish bottles that look like they should contain perfume. (Of course, the samples come in small plastic vials, not glass bottles, but I like to imagine a line of the bottles shining on my studio windowsill.) Over the past year, I’ve collected nearly all of the sample colors in this line of rich, wet inks that flow beautifully and dry relatively quickly – ideal qualities for both writing and sketching. For Christmas I received a bottle of Momiji (Autumn Leaves), a brilliant, deep magenta that I love writing in my journal with. But time and time again, I fill a sketching fountain pen with an Iroshizuku ink, take it out in the field – and end up disappointed. Despite the depth of the colors straight from the pen in the drawn line, they wash with a wimpiness that leaves me wanting. When washed, they can’t seem to hold a candle to most Diamine inks (especially my favorites, Chocolate Brown and Eclipse). I had just filled a pen with a sample of Kiri-Same (Autumn Shower) and was eager to give it a try at Zoka Coffee. 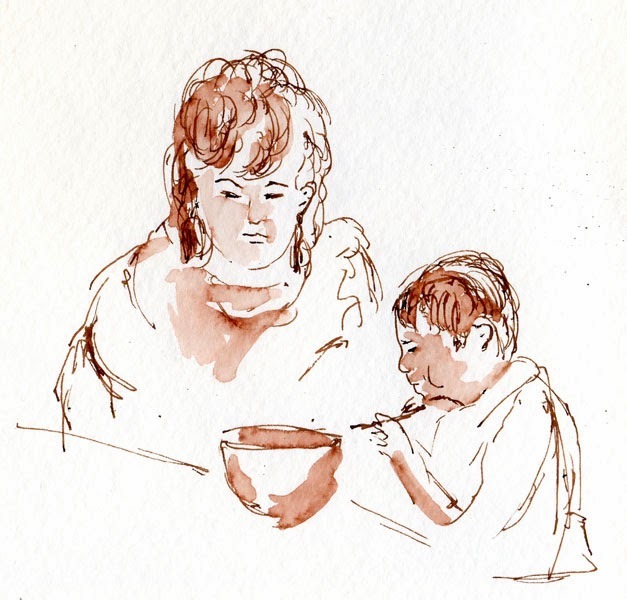 I started a contour line of the woman on the right and her baby, and I was delighted with the medium gray hue that I thought would be perfect for sketching people. But when I washed the lines for shading, they faded to nothing. 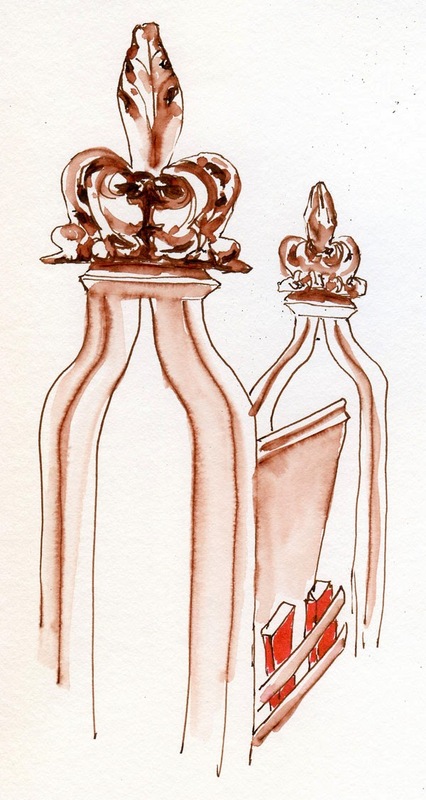 I ended up going back over some of the lines with my ever-faithful Diamine Chocolate Brown to deepen the shadows. As lovely as the Iroshizuku inks are, both in hue and behavior, I’ll probably use most of the samples for writing in my journal instead of sketching. 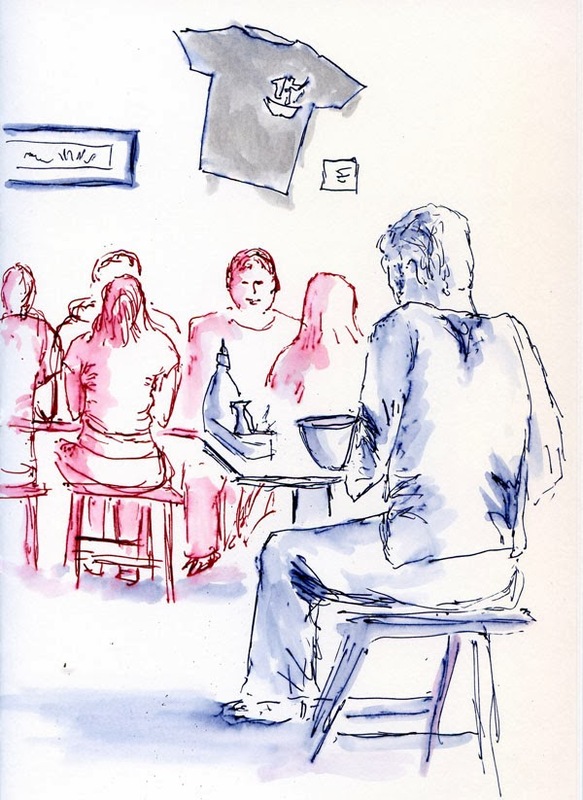 As for the man by the window sketched in bright blue gel ink, that’s another story. I’ve been experimenting with using bright gel ink colors at various points in the composition “story”– a central character (below) or a minor role (top). Book Review: Now Where Was I? 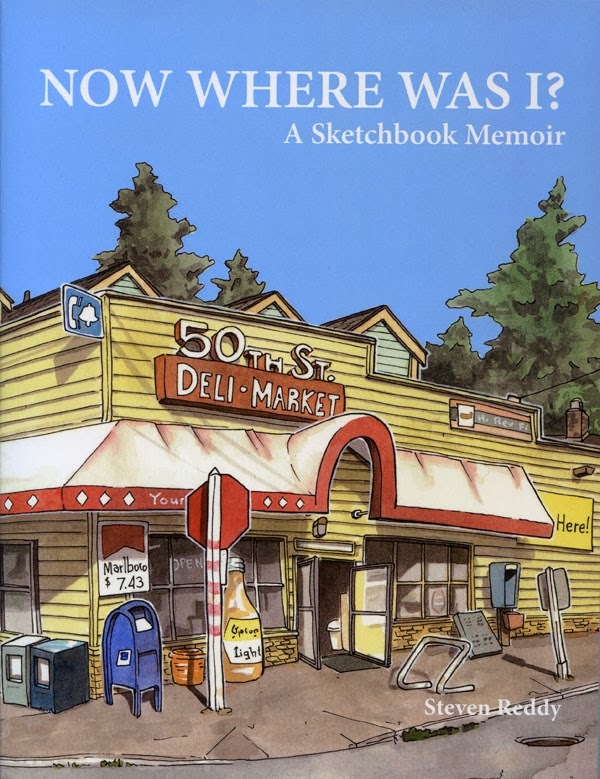 “A sketchbook memoir” is exactly the right subtitle for Now Where Was I?, a brand-new book by Seattle artist and urban sketcher Steven Reddy that was published through a successful Kickstarter campaign. Including paintings, comics and sketches spanning 35 years, the colorful, beautifully published collection reads and views very much like an illustrated autobiography – selective, retrospective, revealing and at the same time concealing. 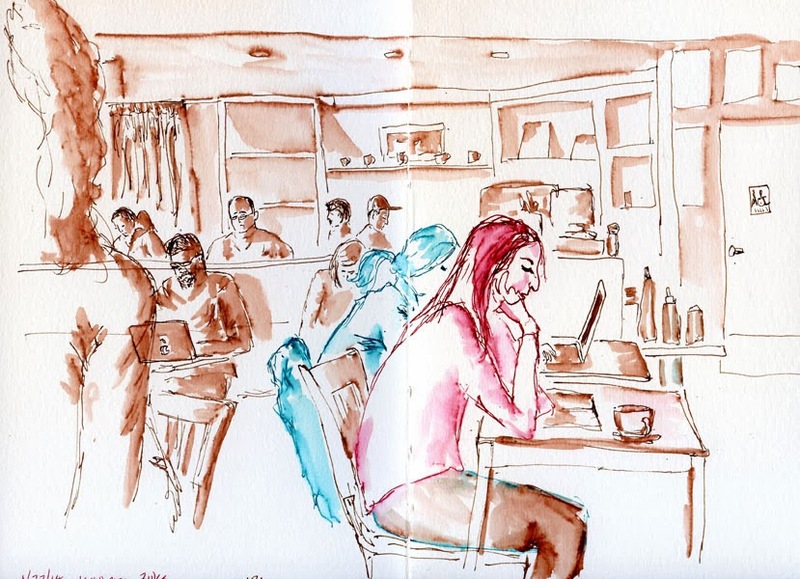 Urban sketches include everything from portraits of gorgeous Seattle Tudor homes to plumbing pipes in Sidney, Iowa, and a house doomed for demolition in Jingdezhen, China. Older oil paintings have more abstract compositions than the on-location sketches, but their central images remain in the slightly quirky illustrative style that has become Steve’s signature. In fact, it’s easy to see that his urban sketches of thrift shop interiors, a favorite subject, had their roots in paintings from decades earlier that depict collections of seemingly unrelated objects: Piles of random stuff come together in a way that somehow makes sense. The overall tone of the works is of intense curiosity about the details of his visual world – no stone left unsketched. At the same time, the focal point of each sketch is crystal-clear, so you have to assume that it’s the result of careful editing. Occasional, brief text provides some context without overly explaining. I found myself literally laughing out loud at his descriptions of questionable foods encountered in China, yet the only sketch of a food-like substance is a chicken’s beak discovered in a meal. ‘Nuff shown. If you want a copy of this inspiring, engaging, entertaining book, you’d better hurry to his Etsy site – only a limited number has been published. 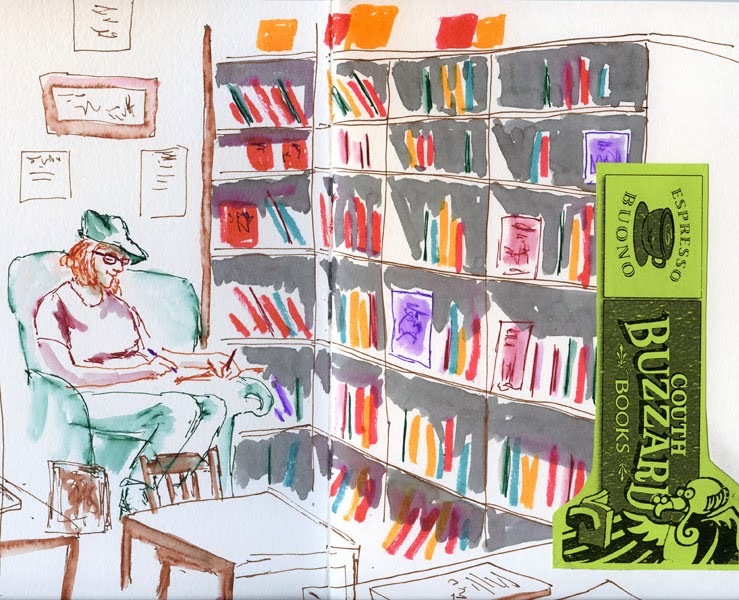 First I sketched Elsa, who had made herself comfortable in the plush velvet-covered chair in the colorful children’s section. Then I moved over to a window table with Blanche to sketch a tree housing a long-abandoned nest across the street. A group selfie commemorated our participation in the worldwide event. 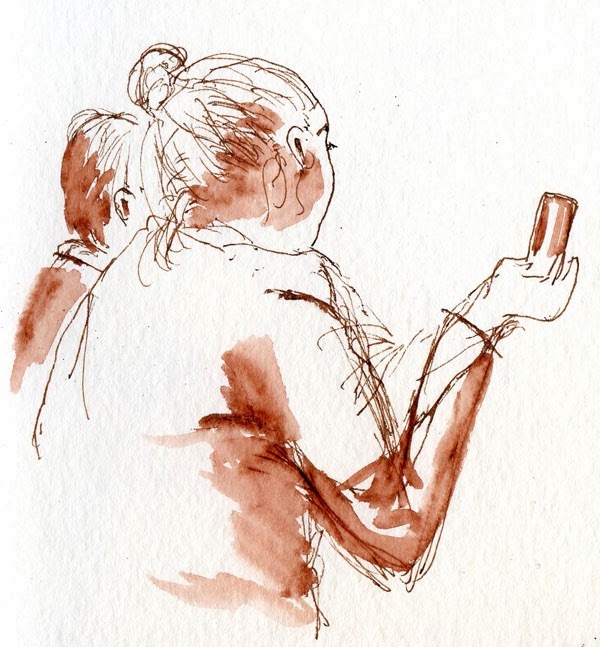 I hope you were able to get out for the World Wide SketchCrawl, too! On my way home from errands this afternoon, I stopped to sketch a tree growing in a traffic circle that I had sketched back in October. In addition to its splendid colors, its asymmetrical shape is what attracted me last fall. Totally bare of leaves, its asymmetry was less obvious today. I must have sketched it again at about the same time of day, because the long shadows were similar. Shadows. . .? Yes! We have clear skies and sunshine! 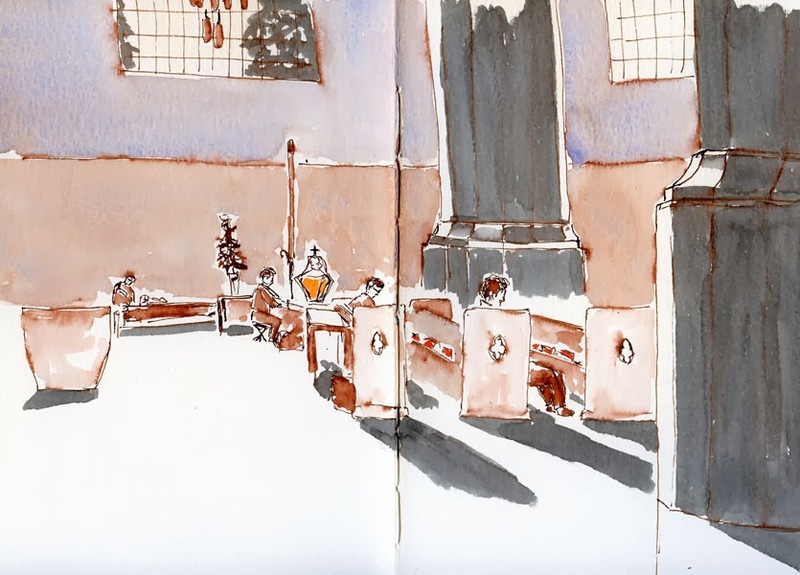 Shortly before Christmas I went to St. Mark’s Cathedral for a choral concert, so my sketching range was limited. But today with the Friday sketchers, I could take in the full scope of the massive sanctuary and sketch from wherever I wanted to. Unfortunately, that made it difficult to choose a composition. I finally settled on one of the windows, the quilt beneath it and a couple of the chandeliers to start with, but I didn’t think that sketch captured the cathedral’s size. So for my second sketch, I moved to the back to sketch the huge pillars along with a few sketchers in the pews for scale. With 15 minutes left before our meeting time, I did a quick detail of the ornate finials on some unused pews that were pushed to one side. 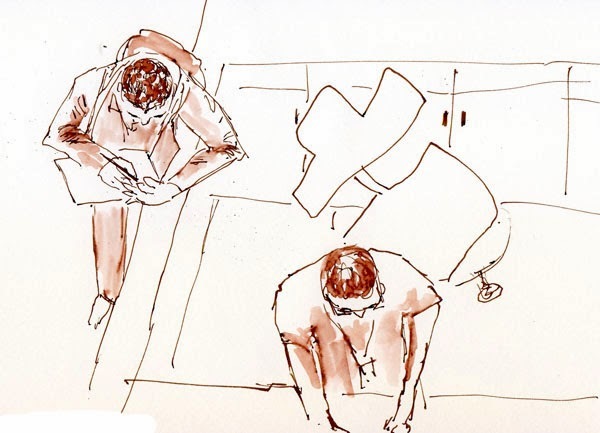 One benefit of sketching inside a cathedral: There’s plenty of (not necessarily comfortable) seating everywhere! Today at Gage’s life drawing studio, our female model’s head was completely shaved. Since I don’t get many opportunities to draw totally hairless heads, I spent quite a bit of the session focusing on getting its shape right. 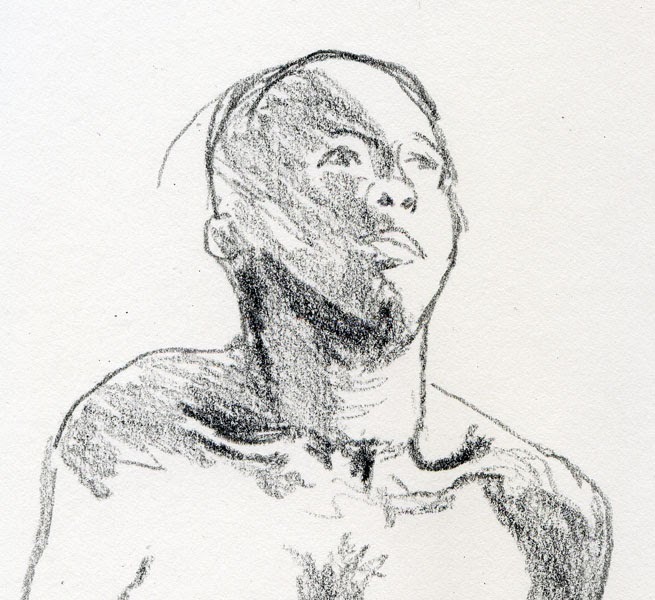 My struggle made me realize how easy it is to cheat in “real life” life drawing when the “models” have hair – or wear hats. Yesterday it was a monkey teapot; today a monkey tree. 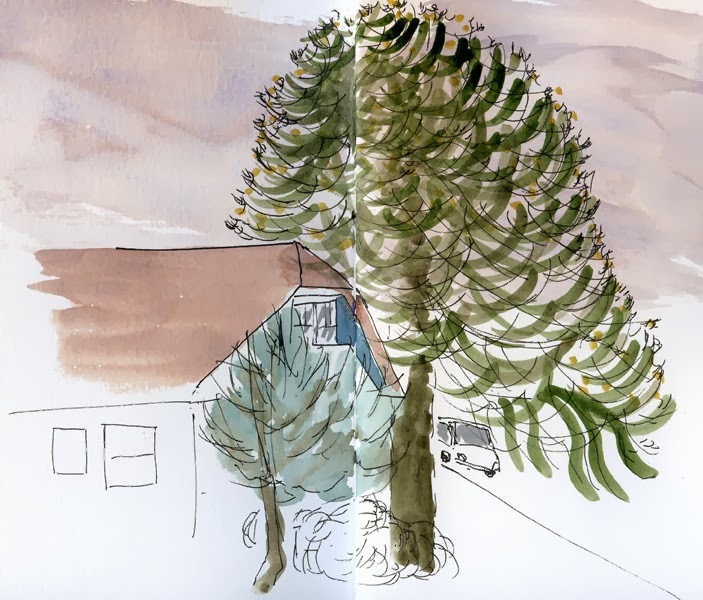 Several of these humongous, majestic trees are in my neighborhood, but many of them are situated in ways that make them awkward to sketch (at least from a car): standing behind tall houses or on busy streets where I can’t park. 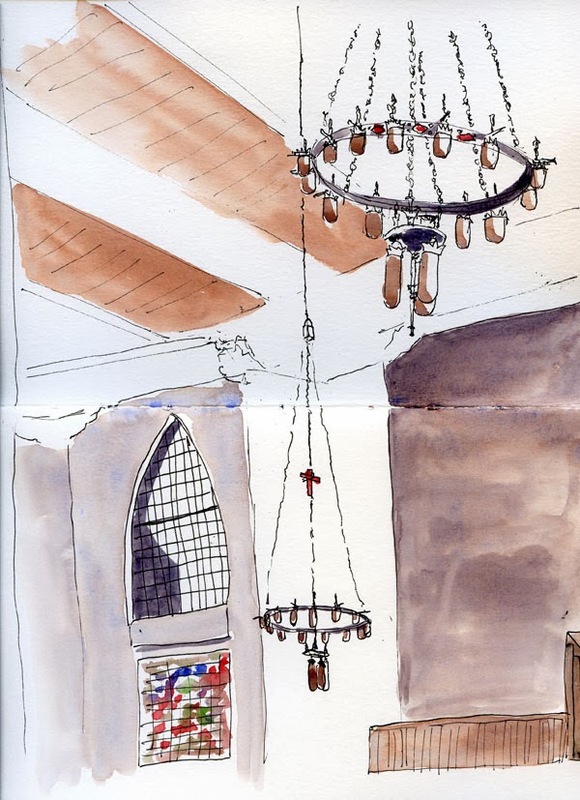 I found this one on a short, quiet street – ideal for sketching. I don’t know much about Araucaria araucana (also called monkey puzzle trees and monkey tail trees), but I’ve seen some with huge pod-like cones at certain times of the year. This one didn’t have any, but instead it had small yellow clusters at the ends of its multitude of “tails.” Since it was my first monkey tree sketch, I used a Kuretake Bimoji brush pen to become familiar with the shape of the branches – curved and fun to make – before painting them. But next time I think I’ll go in directly with watercolor. This was my mother’s teapot, which I inherited when we cleared out my parents’ home after she passed away. It’s not the kind of thing she would have chosen for herself, so I’m guessing it was a gift. She was not the type of woman to cherish material objects; she was often burdened by gifts that she didn’t really like, but she didn’t want to “reject” the giver by getting rid of the gift (you can imagine how much stuff we had to clear out of her house). I think this was one of those. She never used it – it simply sat for decades in the glass cabinet where stuff like this accumulated. It almost went into the “Goodwill” box. But then, even though I have no sentimental memories about it, something made me put it in the “keep” box. 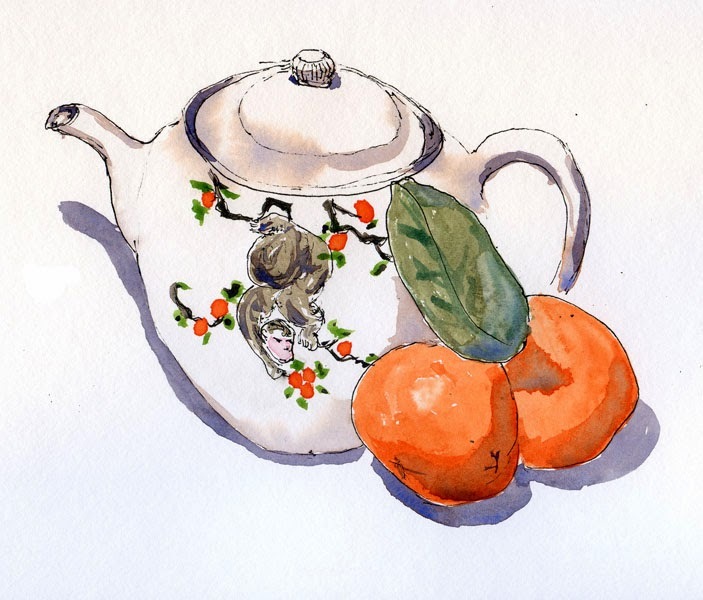 My sketch doesn’t really show how small the teapot is, but those are tiny Satsuma oranges next to it – not full-size oranges. (Back in the day, people seemed to be satisfied with tiny cups of tea – not venti-sized lattes.) Made of rustic ceramic, it’s very delicately painted with a monkey picking persimmons on one side, and two monkeys on the other side (I’ll show you that side in another sketch sometime.) [Edited 2/2/14: See the other side in a still life I painted in a workshop.] I think it’s an allusion to a Japanese children’s tale about a monkey and persimmons. I made the sketch life size, which made me appreciate the delicacy of the original work. I try not to accumulate too much “stuff” of my own, but this teapot now contains a pile of old but random coins that Greg got from his father’s place after he passed away. Somehow it seemed appropriate to store his dad’s coins in my mom’s teapot. 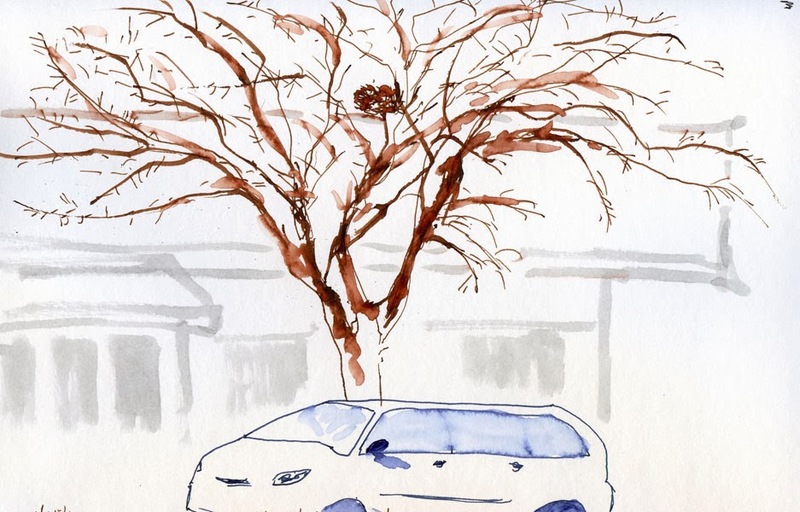 I sketched so many trees at their peak of color growing in traffic circles last fall (Oct. 22, Oct. 23 and Nov. 13 are a few) that I was certain I had sketched this one back then. 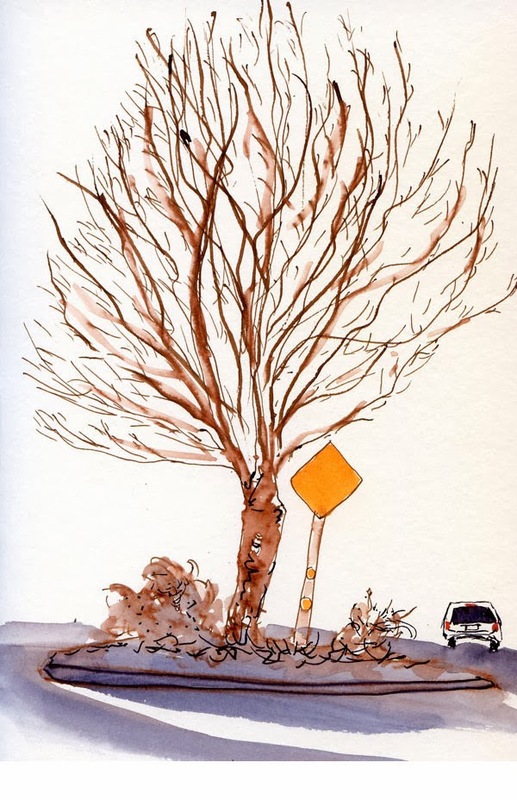 But when I looked through my sketchbooks from October and November, I couldn’t find this particular maple at the intersection of Northeast 83rd Street and Eighth Avenue Northeast. Though it was chilly all day, the sun burned through the morning fog, making the afternoon seem warm (if not feel that way). I even saw shadows (what a treat!) in the late afternoon light. 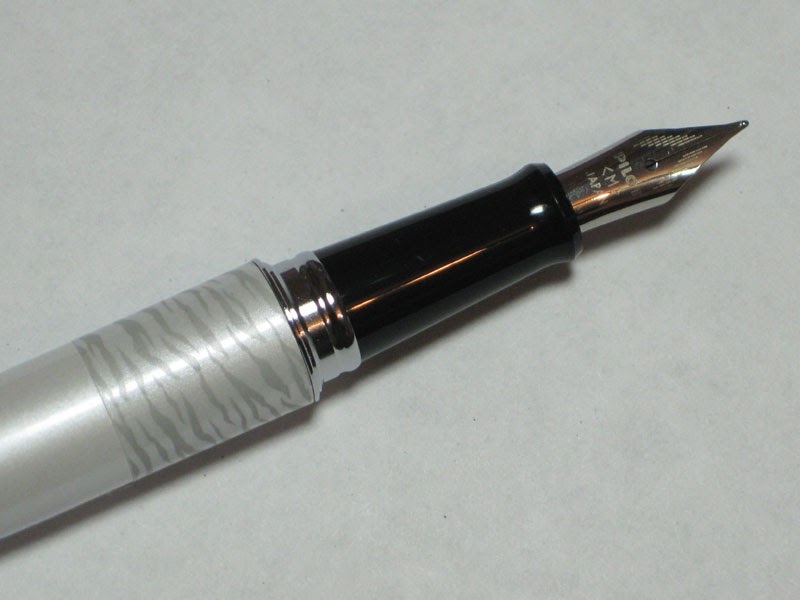 Here’s an update to my Jan. 7 product review of the Pilot Metropolitan. Before giving it an across-the-board favorable review, I wanted to see how it would do after sitting idle for a period of time. Although all fountain pens have to be used regularly to keep them flowing well, I’ve discovered that some can be left idle longer than others. Results might be quite different with a waterproof ink like my favorite Platinum Carbon. I rarely go as long as even a week without using Platinum Carbon, so it would be an unusual circumstance to let it idle that long. But I’m curious, so I’ll try another test soon: Fill the Pilot Metropolitan with Platinum Carbon and leave it idle for two weeks. I have a feeling the Pilot Metropolitan might kick the Lamy off my top 10! Edited 2/7/14: On Jan. 24, I filled both my Pilot Metropolitan and my Lamy Vista with waterproof Platinum Carbon ink. Today, 14 days later, both pens were clogged and skippy when I first tried to write with them. I tried holding a wet paper towel against the nibs for a bit and wiping any ink off. The Lamy required a complete nib flushing to get it flowing properly again. But the Metro was flowing smoothly again after only the paper towel wipe. As I mentioned earlier, it’s unlikely that I would go two weeks without using Platinum Carbon, so this was mostly a theoretical test, but the results are interesting nonetheless. This is not really a book review; it’s just sharing excitement over receiving my copy of Lapin’s limited-edition (I got No. 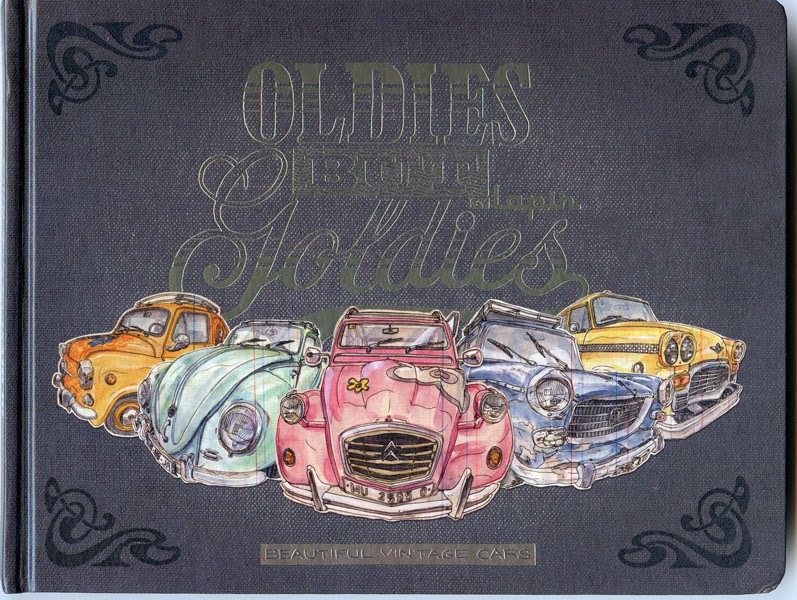 273 of 500), recently crowd-funded book, Oldies But Goldies. What a beauty – a collection of his sketches of vintage cars, most of which he found (astonishingly) parked on the streets of Barcelona where he lives and in various other countries. 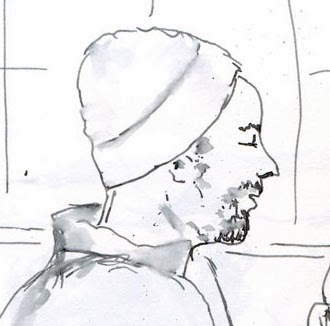 All the details he has sketched are amazing, and it’s fun to look for the tiny self-portrait he has included in many sketches where it was reflected in a shiny surface. 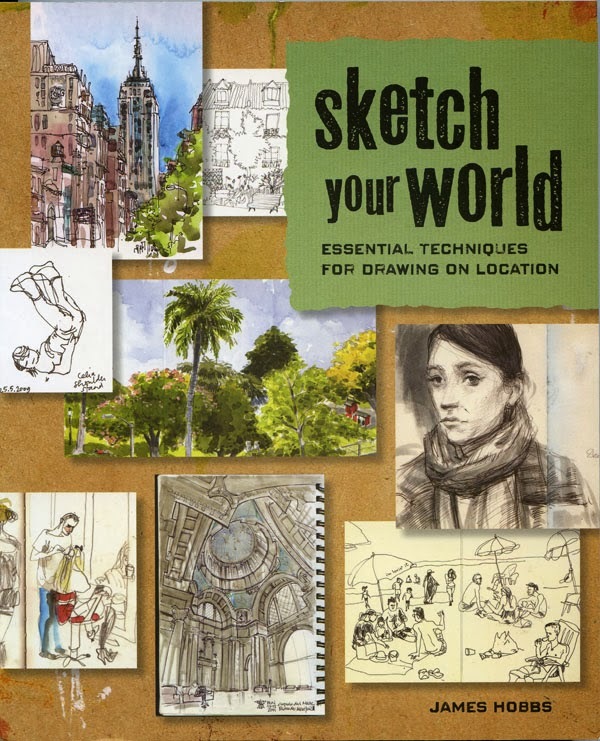 If you’ve ever felt moved to keep a sketchbook while traveling, or if you’ve ever wanted to sketch the view of a favorite park in your own home town, but you just haven’t gotten out the door yet, James Hobbs has written a book for you: Sketch Your World – Essential Techniques for Drawing on Location. More than any other book I’ve read on the topic of sketching on location (and I’ve tried to seek out and read them all), this is one I’d recommend to someone who has never drawn before but is motivated by the desire to capture one’s world on paper. 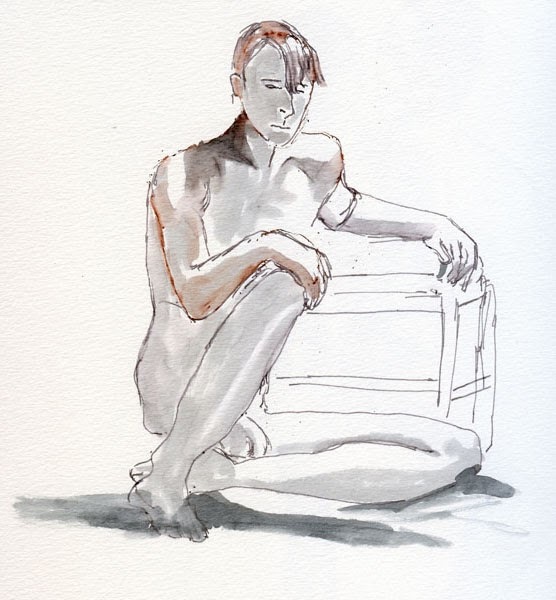 Although it offers some tips and techniques on the basics of drawing (perspective, composition, tone), this book’s emphasis is not on “how to draw” but on embracing the spirit of urban sketching and running with it – wherever that run may lead you. 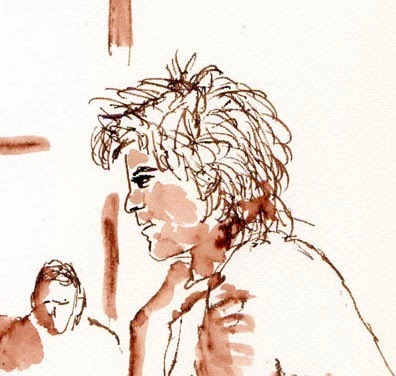 In addition to chapters on materials and the mechanics of sketching in the field, Hobbs includes sections on ways to approach specific subject matter, such as architecture, people, travel and reportage sketching. 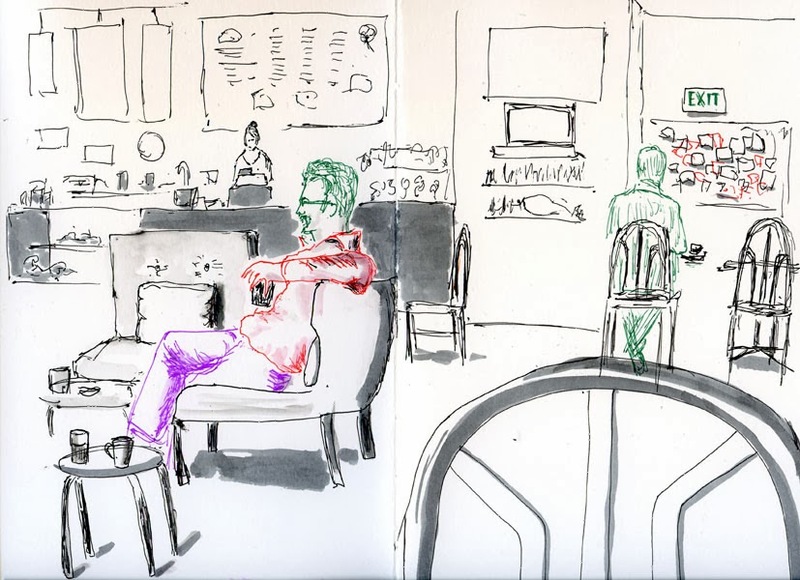 One chapter focuses on digital tools, such as using a tablet, and another provides information on joining sketching communities, either online or locally. Throughout these chapters, featured artists like Gabriel Campanario, Miguel Herranz, Marina Grechanik and others discuss how they approach their subject matter specialty. 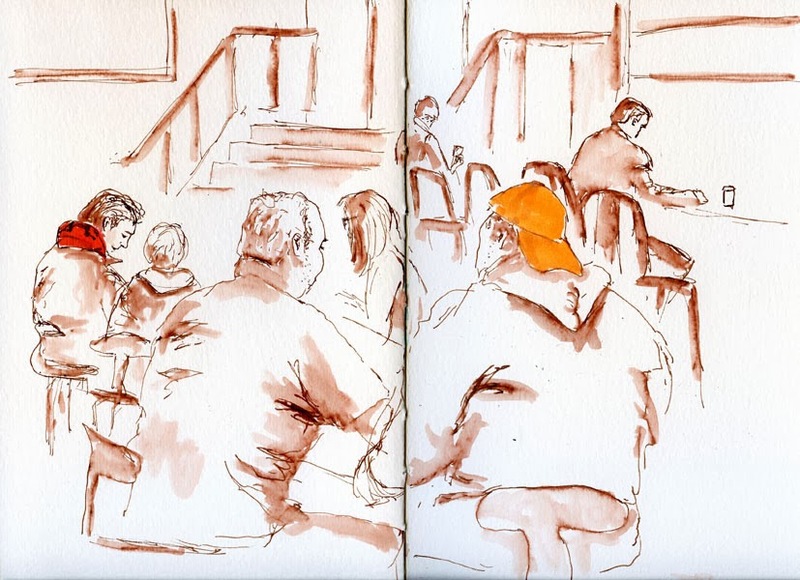 For the second day in a row, I was back at MOHAI – this time in the company of 44 other Seattle Urban Sketchers. On this quiet morning before “the” game (I won’t even bother naming it), we sketchers had the museum practically to ourselves. It was fun to look around and see sketchers everywhere. 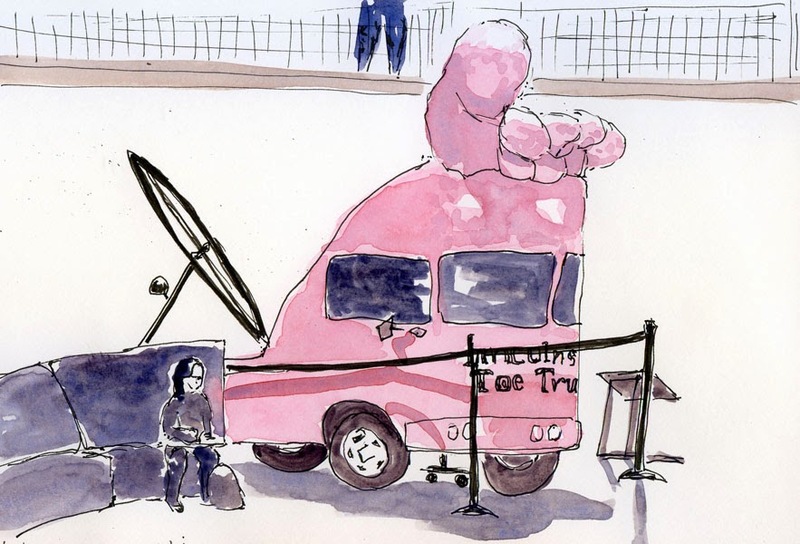 Since yesterday I focused on the views outside MOHAI, today I sketched three colorful Seattle icons on the main floor: the bright pink Lincoln Toe Truck (next to Gail sketching), the original Rainier Brewery R, and the 1919 Boeing B-1 mail carrier (Boeing’s first commercial plane). 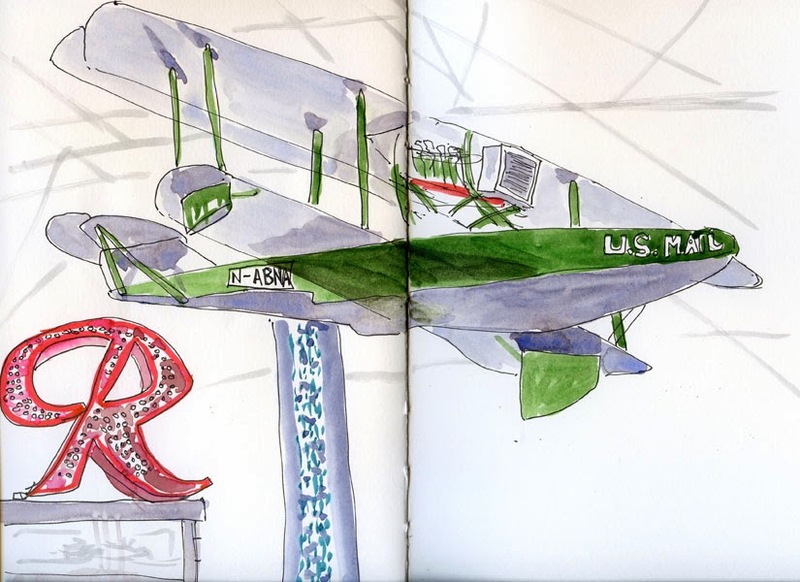 I sketched all three icons last May when I first visited MOHAI in its new location, and these eye-catching images from Seattle’s past are still fun to sketch. I had only about 10 minutes left before our meeting time – enough for one more. I was looking down over the railing from the second floor when I spotted Dan sketching next to the front admissions counter. Thanks to Gail, Jane, Gabi and MOHAI for arranging a great sketchout! 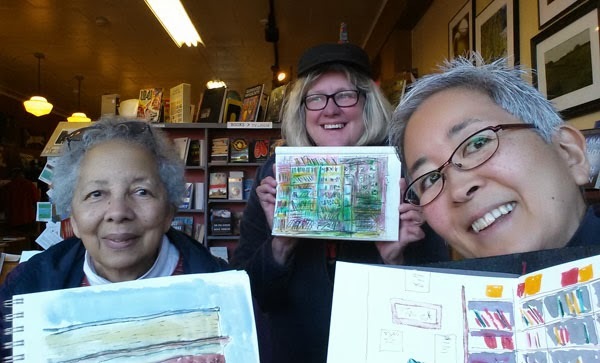 Bravo to the new urban sketchers who sketched with me at the Museum of History and Industry’s Urban Sketchers in Residence program! 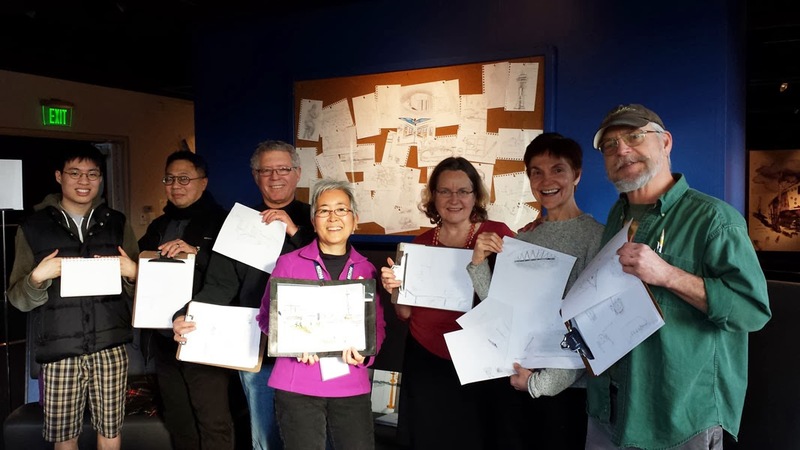 Many of these participants had never sketched before, but they all fully embraced the Urban Sketchers manifesto for a fun afternoon at MOHAI. 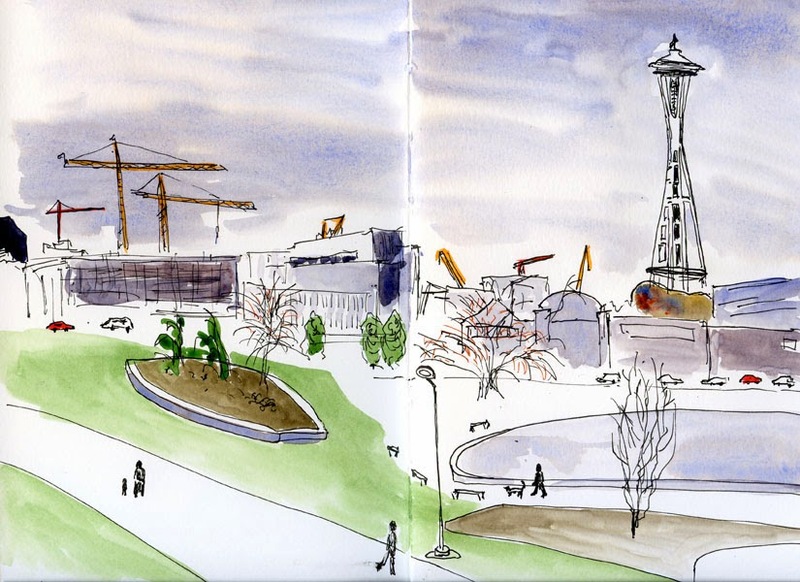 Then in the Urban Sketchers room adjacent to Gabi’s exhibit, I sketched a view of the Space Needle and the park outside MOHAI while chatting with other sketchers. 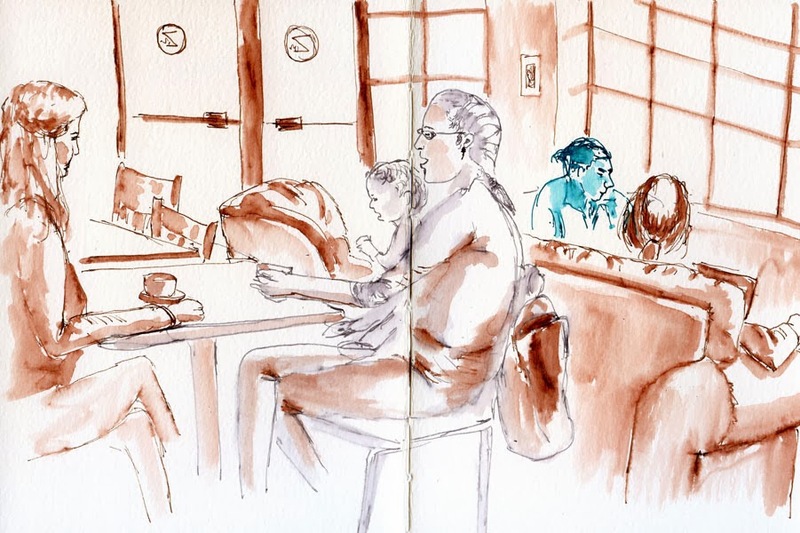 Many thanks to Gabi and MOHAI for inviting me to be an Urban Sketcher in Residence! I’m already looking forward to March 29 when I get to do it again. When I say the word “ramen,” what probably springs to mind is the cello-wrapped bricks of dehydrated noodles that cost about 10 for a buck (perhaps you survived your college dorm years on those). But that kind of ramen is a far cry from the kind you can get on every street corner in Japan: huge bowls of rich, steaming broth filled with green onions, bean sprouts and the meat of your choice (or tofu) and brimming with a pile of slightly curly noodles. You can get that kind at only a few places in Seattle, and Samurai Noodle in the University District is one of them. On a cold, foggy, winter day, it was the ideal comfort food for me – not because my mom used to make it (she actually made me the other kind that comes cello-wrapped, and I confess that I still occasionally eat that, too) but because it’s a huge, steaming bowl of carbohydrates that warmed me through and through. The Henry Art Gallery was my primary destination this morning, but my bus got me to the University District a little earlier than the museum opened, so I walked to the nearby Burke Museum to kill 20 minutes. 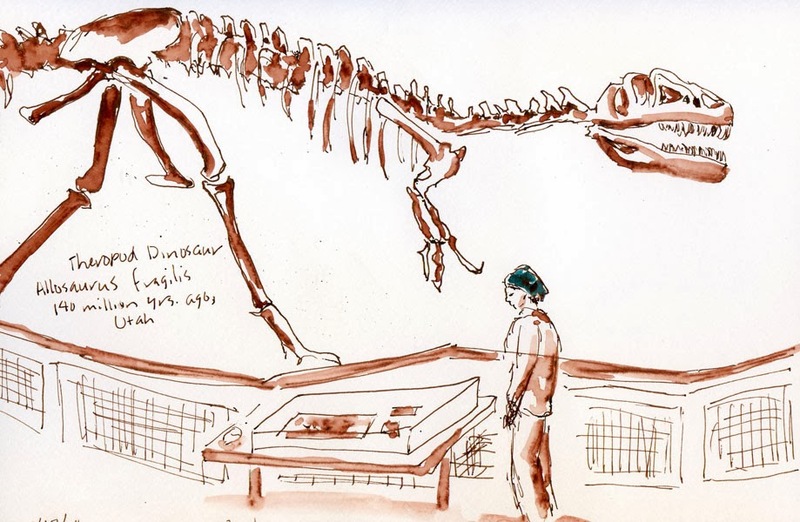 Since nearly a year ago when I visited the Burke with the Friday sketchers and became enamored with all the prehistoric skeletons, I’ve gone back several times to work toward fulfilling my goal of sketching every bone in the place (it might take me a decade or two). Today I sketched half of Allosaurus Fragilis, whose tail is so long that I’ll have to bring my landscape-orientation sketchbook if I want to fit the entire skeleton. Maybe next time. Since I hadn’t been to the Henry in quite a while, I was looking forward to seeing and sketching something new. As far as art viewing goes, I’m not art-history educated, but I try to keep an open mind about classical as well as contemporary art. I won’t name names, but I’m clueless about one exhibit I experienced today (I was going to say, “the art I saw,” but I’m not sure what I saw). I wandered into a huge gallery that had nothing but a couple of doors in one wall and some pillows on the floor. I walked through those doors into another huge space with some more pillows on the floor. And a stack of papers. Hmmm. “Conceptual” art, I’m sure . . . but I guess I missed the concept. Not only did I not see anything to sketch – I didn’t see anything to think about. Thankfully, there was plenty to see in another exhibit – Hague Yang’s “Anachronistic Layers of Dispersion.” Once again, I think I missed the concept, but the art itself was intriguing, though difficult to sketch. It was made of lots and lots of mini blinds of various colors and lengths strung from the ceiling at various angles and filling the room. I expected the blinds to move or rotate like mobiles, but they were strangely static. Next time I think I’ll just stay longer at the Burke to sketch more bones and skip the Henry. 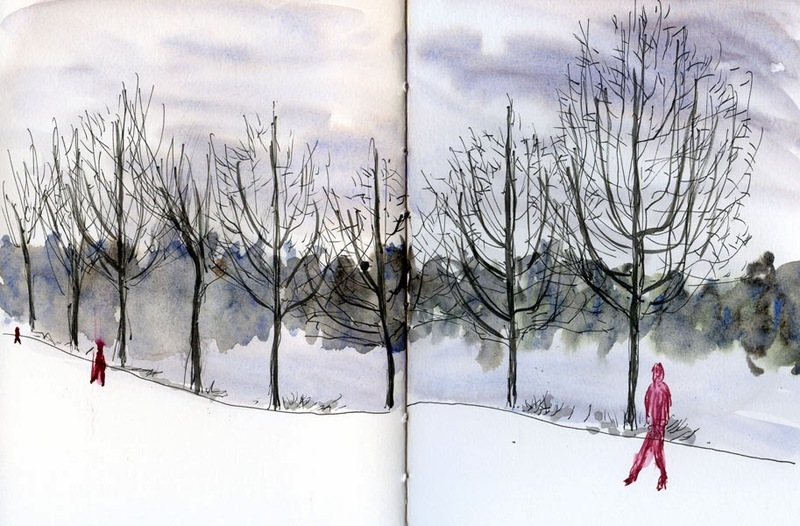 Though not the most colorful, winter is the most informative time to closely observe and sketch trees. When they’re fully in leaf, I guess I take them for granted. I drive by this huge willow near Green Lake regularly, but it never caught my attention last summer when it was green. Today, its thin, weeping limbs black and striking against the thick, white sky, it was impossible to ignore. 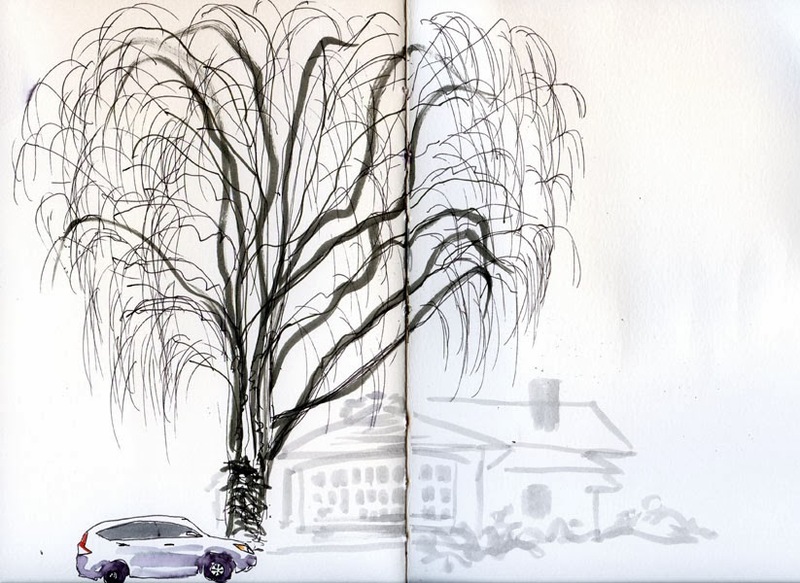 Although the sky was steely, it wasn’t intolerably cold out, so after sketching the willow, I drove around to the other side of the lake and sketched my favorite maples. Last year I didn’t get around to sketching them in their winter dress (or lack thereof) until early March, yet they still had noticeable clusters of brown leaves then. This year, a couple of good storms in late fall blew them bare, and they’re as naked as they’ll ever be. 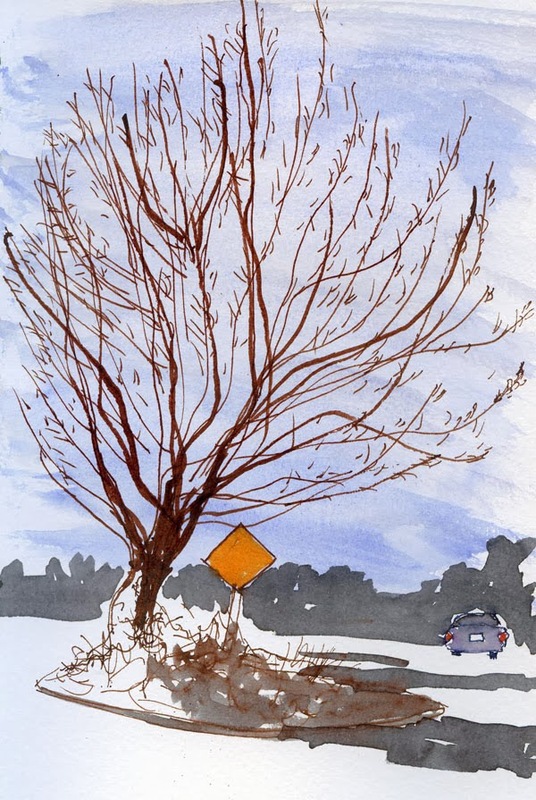 See the whole series of sketches of these maple trees in all seasons. Sometimes when my time is very limited, but I still want to sketch, I reach for whatever is most handy. Temperatures have been in the upper 40s and lower 50s the past few days – altogether tropical compared to the rest of the country. 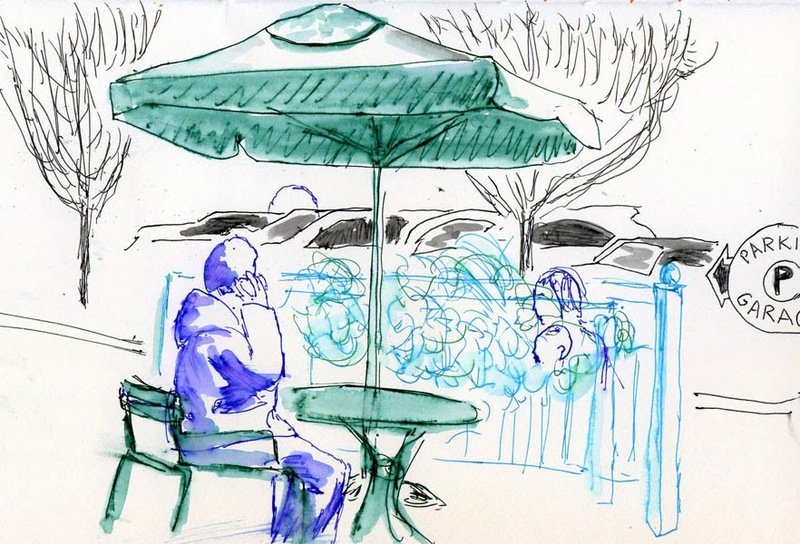 I was so excited about it that when I had 15 minutes before I had to leave for the next errand, I stopped at Starbucks for a quick mid-morning coffee and sketch – and got an outdoor table! I guess my “victims” were as busy as I was – a woman, her baby and a friend left a minute after I got started (you can still see their ghosts). But right after they left, a woman stopped to make a phone call, so I pounced quickly. 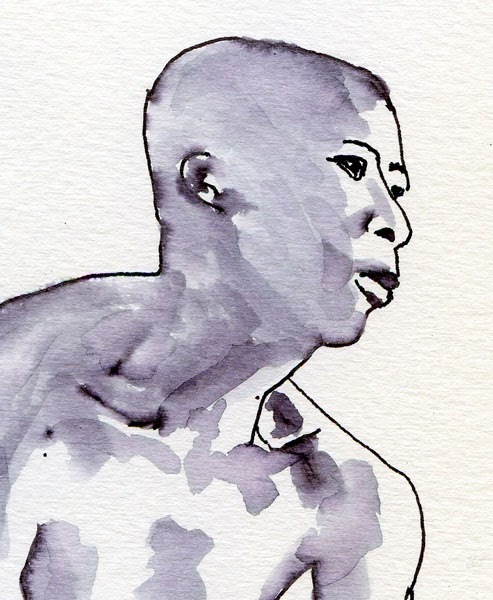 Gel ink – an inherently quick medium because it flows so smoothly, especially on Fabriano Studio hot press – was just what I needed. After yesterday’s exploration of gel ink pens as a sketching medium, I dug more deeply into some drawers and found several different brands (OK, I admit, I have a really large stash of gel pens). The ones I tried yesterday, Zebra Sarasa, although my favorite for writing, don’t bleed as much as I had hoped. But after testing all the brands I owned, I found that Foray Gelio pens bleed like crazy when water is applied – score! I had picked them up at Office Depot for $12.99 for a set of 20 colors. Maybe the lower the quality and price of a gel pen, the more likely it is to run when wet. In any case, these Foray Gelio pens are a fast, easy way to add color that I can wash just as easily with a waterbrush. The only thing I don’t like is that they can leave tiny blobs of ink that are easy to smear before they dry. 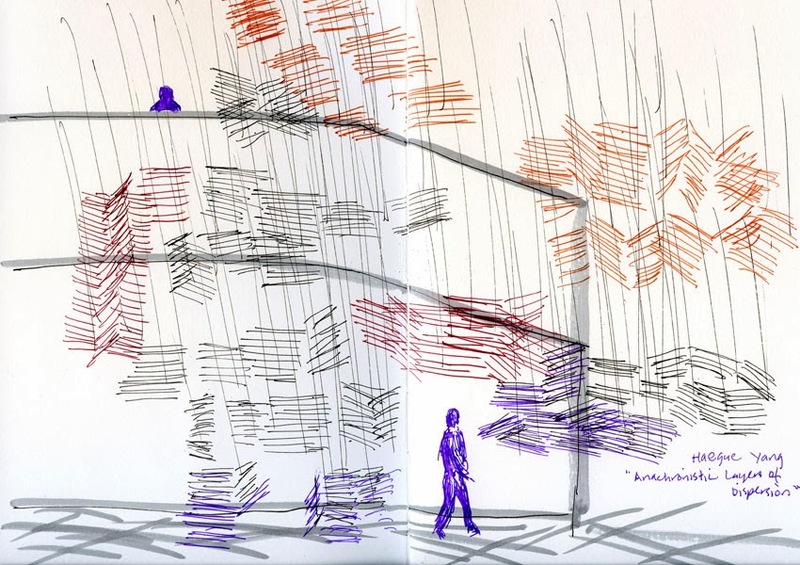 Yesterday I saw some fantastic sketches by Marina Grechanik that had been done with a four-color Bic ballpoint pen. As I mentioned the other day when I was trying my hand at a still life in ballpoint, I’m not a huge fan of ballpoint pens even for jotting notes, let alone sketching. But Marina’s lively line work in multiple colors inspired me to try that style of sketching – except I used gel pens instead. I keep gel pens in lots of different colors all over the house, and they are my favorite writing instruments for making grocery lists, notations in calendars or other casual writing, but it had never occurred to me to try them as a sketching medium. I grabbed several on my way to yoga class and stopped first for coffee at Revolutions Espresso. Knowing that gel ink is water soluble (I’ve certainly had my shopping lists smeared by raindrops), I was disappointed that I couldn’t really make a wash with the ink for shading. 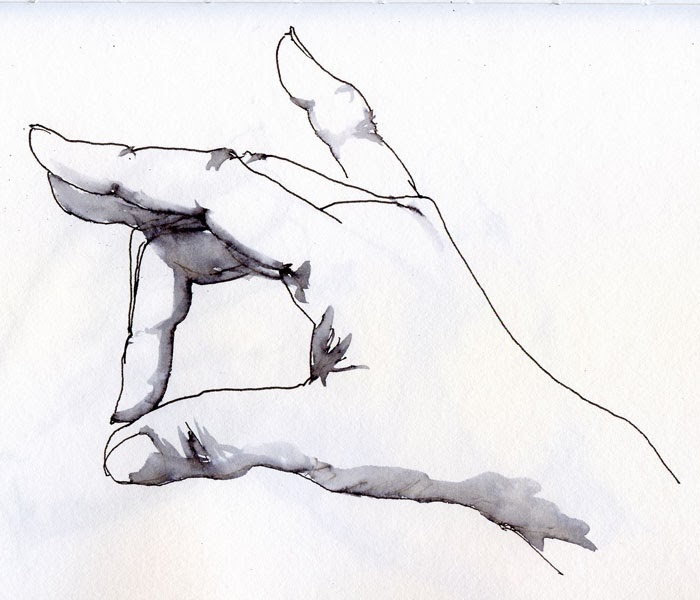 So in areas where I needed darker shadows, I used my waterbrush filled with Diamine Grey ink, and that did the trick. Out in the Green Lake parking lot, I used both a Zig marker and Diamine Grey for shading after drawing the cars and trees with gel pens. Like Marina did, I dispensed with any thought of sticking with realistic colors, and the bright gel colors were a ton of fun! I’m keeping them in my bag – at least for a while! What a lazy Sunday! I was too lazy to even walk downstairs to the kitchen for some fruit. This still life is one I see on my desk every day. It’s one of the first things I sketched back in September 2011 when I first made the commitment to draw every day. I’ve apparently acquired a few more pencils since then. 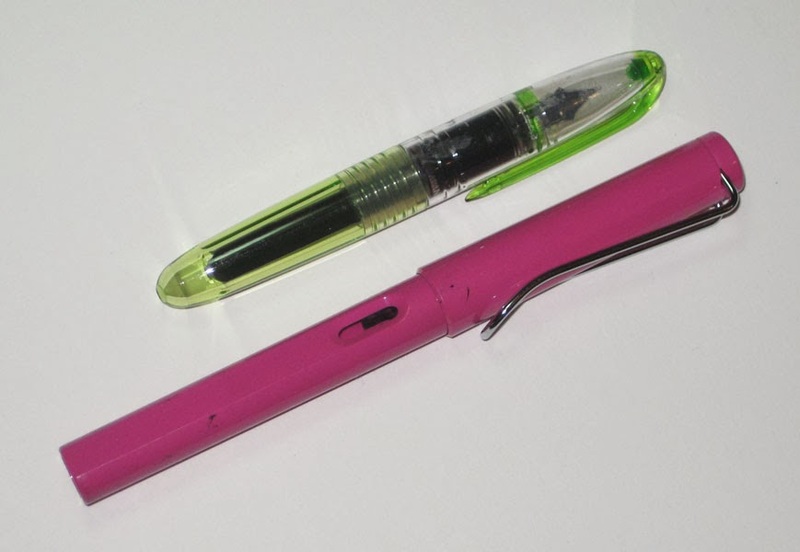 The tiny green Pilot Petit1 Mini shown next to a Lamy Safari. 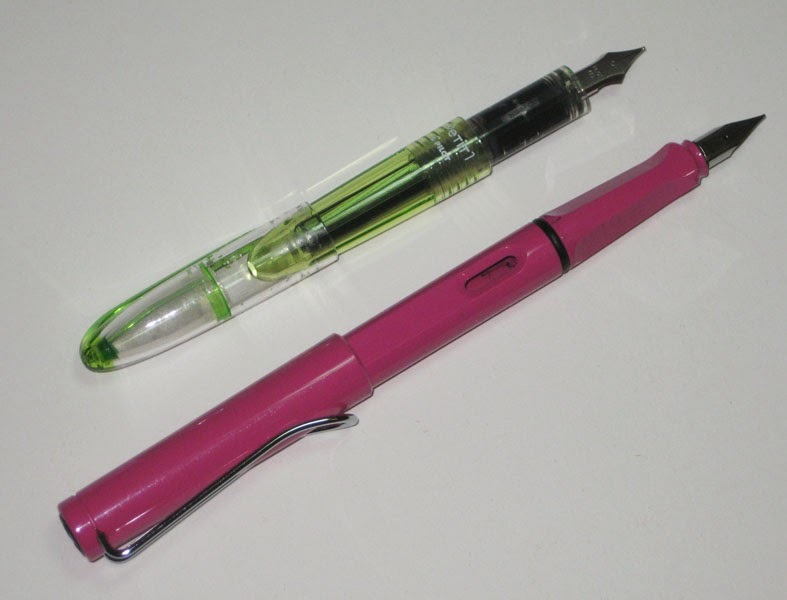 Anyone who uses a fountain pen knows that if you leave it idle for too long, it will clog and need to be flushed. If you own numerous pens, most fountain pen maintenance advice recommends using only a few at a time and rotating the collection so that each will get used frequently enough to keep it flowing well. I generally heed this advice, keeping three or four sketching pens in my bag at a time (plus a few more at home for writing). The one exception has been an ongoing dilemma for me. 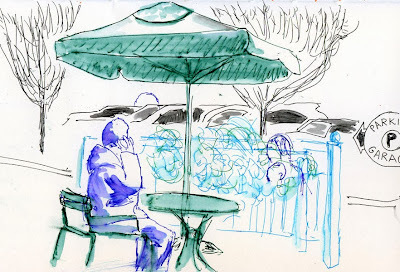 When I go on fitness walks around Green Lake a few times a week, I take only my ultra-minimalist sketch kit housed in a Travelon Convertible Travel Wallet (you can see it on my Current Favorite Materials page). I generally don’t sketch on these walks, but every now and then I’ll spot a heron or some other wildlife, so I always carry sketch gear with me, just in case. 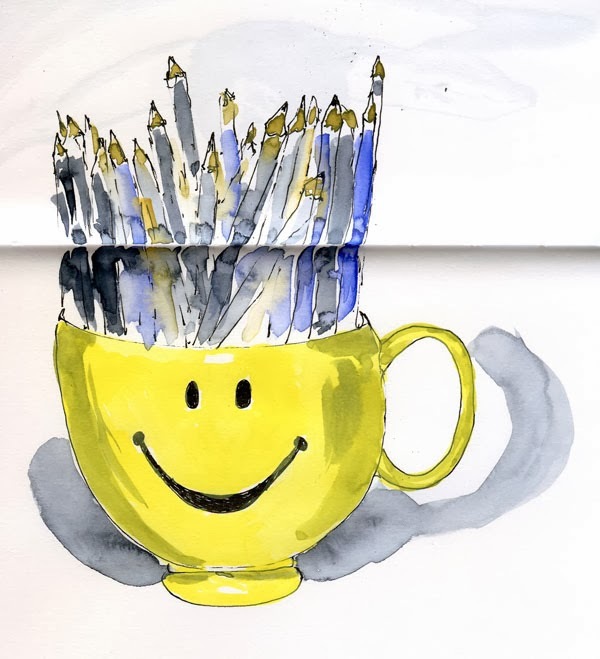 The kit includes nothing more than a Lamy fountain pen filled with water-soluble ink, a waterbrush, a dark gray Kuretake Zig Clean Color brush marker and a handmade sketchbooklet. Posted, the Petit1 is still shorter and lighter than the Safari. A couple months ago I had the frustrating experience of wanting to sketch a heron, but because the Lamy Vista I carry in the bag rarely gets used, it was all clogged and barely useable. I know it needs to be in the regular rotation to keep it flowing, but since I rarely use it, I don’t remember to rotate it. Fast-forward to yesterday, when I was going through some fountain pens that I’ve stopped using for various reasons. One was a Pilot Petit1 Mini, which is ridiculously inexpensive ($3.80 at JetPens.com) and comes in lots of novelty colors. Reading many favorable reviews about it, I bought one on a whim, unable to imagine how good (or bad) a pen this cheap could possibly be. As it turns out, the nib is surprisingly fine and smooth, and I enjoy using it. I thought that once I used up the bright apple green ink it came with, I’d fill it with sketching ink and take it out sometime. But before using up the green ink, I forgot all about it. I bought the pen about a year ago, and I hadn’t touched it in probably 10 months. I figured it was all clogged up and hardly worth flushing – but shock of shocks, it started writing smoothly from the first stroke! I’m not kidding – it was as fresh as the day I first popped the cartridge in. It has the added benefit of being very small and light (see photos). Immediately dumping out the remaining apple green ink, I syringe-filled the cartridge with Private Reserve Velvet Black ink and put the pen in my ultra-minimalist bag. I may not see the heron again for several weeks or months; will the Pilot Petit1 be ready? Stay tuned. Updated 1/20/14: To learn about another pen that I've discovered has a long idle time, see my review of the Pilot Metropolitan and an idleness update on it. Updated 2/7/14: I didn’t have need for my Pilot Petit1 today, but the results of the idleness test I was running with my Lamy Vista vs. Pilot Metropolitan filled with Platinum Carbon reminded me that I hadn’t used the Petit1 since I filled it with water-soluble Private Reserve Velvet Black ink on Jan. 12. I just tested it – and it wrote like a charm! No skipping, blobbing or clogging after being idle for 24 days. I wonder how it would do if filled with Platinum Carbon and left idle for 14 days. . . ? Stay tuned! Updated 2/22/14: Even waterproof Platinum Carbon ink, which is hard on most fountain pens when left idle for any length of time, didn't cow the tiny but mighty Pilot Petit1! See the full results of my test in which I pit the Petit1 against the Platinum Preppy, another cheap but surprisingly good fountain pen.